President Nicolás Maduro organizes conference with political and cultural activities to pay tribute to former leader Salvador Allende and the 40 year-anniversary of the coup. A number of events will be organized from Sept. 11-13 in Caracas following Venezuelan President Nicolás Maduro’s announcement of a multinational event against “fascism.” It will be organized in memory of Chile’s former President Salvador Allende, and will start on the 40 year-anniversary of the military coup that overthrew him. The Venezuelan Foreign Affairs Minister Elías Jaua indicated that activities would be organized for the occasion, with participants from a number of European, South and Central American countries. Latin America’s first democratically elected Marxist president will be at the forefront of the commemoration. Jaua emphasized that one the main events would be a march Wednesday. The rendezvous has been set for 9 a.m. at Plaza Salvador Allende. 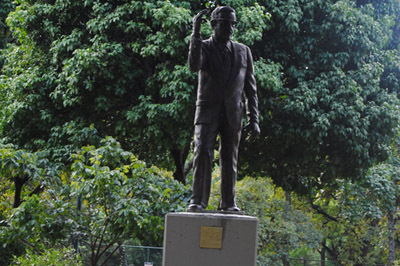 After the government’s floral tribute to the Chilean president’s statue, the march will proceed through Caracas toward the presidential palace. At the end of the march, musical performances by Venezuelan and Chilean artists and political speeches will take place. The lead event will be a speech by Venezuela’s President of the Republic Nicolás Maduro. In the following days, forums about fascist ideology and its principal characteristics will run alongside other related cultural activities. The forum entitled “Expression of Fascism in Latin America” will mark the closing ceremony of political activity on Friday 13. Unofficial social mobilizations will continue throughout the weekend, with the establishment of camp sites in the park Los Caobos.